We’re in the throes of winter! Actually, thumb we’re not here in Miami. After the ridiculous cold last week, order it’s been a crisp and beautiful 70 degrees every day. This is why I live here! But enough bragging. For most of you, it’s still freezing outside and that makes salads really unappealing. Cold vegetables? No thanks. You want something warm and rich, like a lasagna. Or like this warm winter vegetable salad. You start with rutabaga (or potatoes), carrots, leeks and brussel sprouts. Those get roasted with some olive oil, salt, pepper, fresh herbs and just a little bit of applewood smoked bacon. You know, because it’s winter and you need bacon in the wintertime. Once they’re caramelized and delicious-looking, you toss everything with some whole wheat orzo and drizzle with a balsamic reduction. This salad doesn’t mess around – it’s bold and rich from the roasted vegetables, woodsy from the herbs and a little smoky from of the bacon. It’s everything you could ever ask for in a salad – except for lettuce. If you have leftovers, the balsamic reduction will keep in the fridge for a few months. Just make sure to store it in an air-tight container. You may have to reheat it before you use it again. Preheat the oven to 375° while you prep your vegetables. Toss the cut vegetables with the bacon, olive oil, salt, pepper, thyme and rosemary and place in a big casserole dish. Roast in the oven for about 30 minutes, stirring occasionally. The vegetables are done when they’re tender and slightly browned or caramelized around the edges. While the vegetables roast, cook your orzo according to package directions. You’ll want to make sure it stays al dente. After you drain the orzo, rinse it with cold water in a colander to stop it cooking. Place the balsamic vinegar in a small pot and cook over low heat until it reduces by about half – 10 minutes or so. 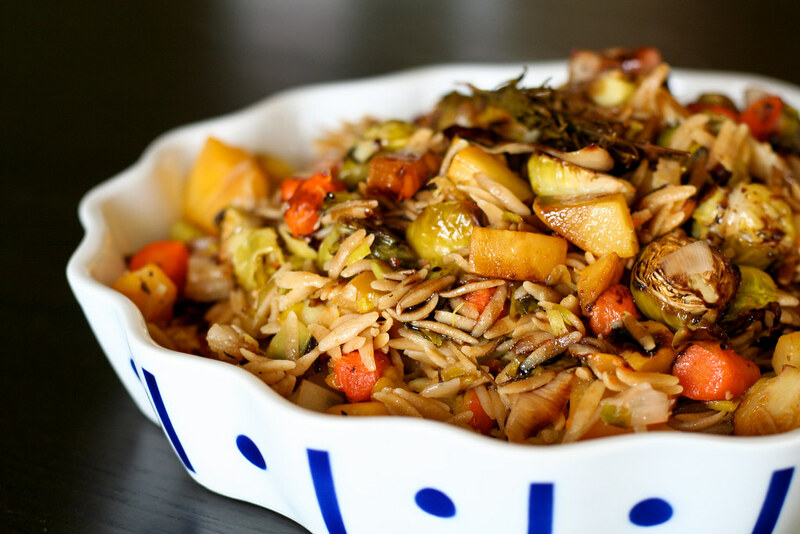 When the vegetables are done, discard the thyme and rosemary sprigs and toss the orzo into the casserole dish and stir everything until well-combined and the pasta is slightly coated with the oil from the pan. Serve and drizzle with some of the balsamic reduction. This sounds absolutely delicious. So many ingredients that I would not have thought to combine. Thank you for a great idea, I have already bookmarked the recipe and can’t wait to make it. This looks great! It’s definitely on the menu for next week. I hear ya about the South Florida weather – I’m in West Palm. Although, I enjoyed our cold snap! I love sweaters and fuzzy socks! I have way too much winter clothing for this place. I’m sick of wearing tank tops! Wow…that really does look delicious! I don’t think I’ve ever tried rutabaga, sounds like a great way to start. 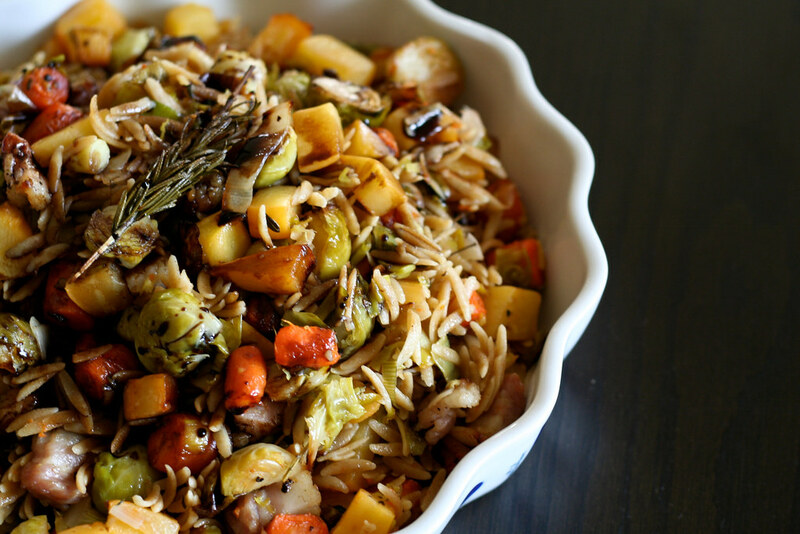 I love the idea of adding the orzo to the roasting pan to toss. I would have done the opposite but this seems like a much better way to make sure you soak up all of those delicious pan drippings. That’s a technique I am going to keep! Thanks! I am inspired by so many of your dishes. I thought it was time I told you how much I think they rock! Thanks for that. This seemed like the perfect recipe to try on a frigid Tuesday night in Brooklyn, and it did not disappoint! We ended up reducing a tiny bit of the oil that went in for the roasting, then drizzled it with black truffle oil in addition to the balsamic, and I thought my tastebuds were going to explode. Definitely going to make this no less than 5 or 6 more times before March rolls in. Thanks for the great recipe! Thanks for this awesome-sounding recipe! I’m in Pennsylvania stranded in all the snow, and I thought I was going to be reduced to making fish sticks tonight until I came across this post! Can’t wait to try it! I made this recipe on a cold Colorado night. It was delicious. Also, it was great the next day for lunch. Thank you for all the great recipes. Oh how I wish it were winter, so I could make this this beautiful salad. I ADORE roasted vegetables.